BROOKLYN NINE-NINE is shaking things up when the show returns for its third season. 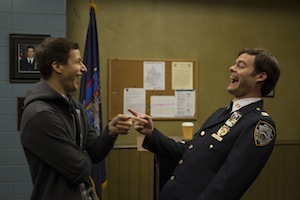 The show’s sophomore season ended with two sizable shifts — Holt was “promoted” and now is working at the NYPD Public Relations department (and a new captain has been brought in for the Nine-Nine); and after two seasons of dancing around their feelings for each other (occasionally, literally), Jake and Amy shared a real kiss, after locking lips a couple of times for a case. There are quite a bit of transitions at play going into season 3. What discussions did the writers have about how much things could be shifted? Dan Goor: It’s always fun to shift the world of your characters so they have to face different challenges and different circumstances. We thought it would be fun and funny to have a new captain come in and really mess with the world of the Nine-Nine. Similarly, we thought it would be fun to see Holt taken out of his dream job, and placed in the hell that Wuntch has created for him. In terms of how long we’re going to do it, we didn’t want it to be forever, and we understand the importance of having Captain Holt back among the squad at the Nine-Nine. It’s always a balancing act, but what we tried to do is have the fun of the promise of that premise. And then once we’ve had that fun, find a way to resolve it so we can get back to some of the dynamics that we enjoy. Is the Nine-Nine or Holt in a worse position when we find them in season 3? DG: I feel like it goes back and forth, but in general, it’s Holt who is worse off, because at least the rest of the Nine-Nine has each other to keep one another company. DG: [It’s a] tremendous amount of fun. Andre [Braugher (Holt)] is such an incredible actor, and so dignified. So it’s always funny to see him in undignified situations, like having to put on the pigeon costume in the premiere. Is Holt genuinely trying to make it work in this new job, or is he merely trying to get by? DG: I think that is the internal struggle and the arc of that character in that situation. I think the first episode, that’s certainly the central story of it…is it worth it to fight? Do I still have fight left in me? And what am I fighting for at this point? On a slightly lighter note, Jake and Amy kissed “for reals” at the end of last season. What can you preview about where we find them? DG: We pick up exactly where we left off, so they’ve just kissed [for real], but have not had a chance to talk about it when their world is turned completely upside down. So they have to figure out what the hell that kiss means, and that is the first thing we deal with for the two of them. And it’s complicated. It’s not just that they work together, and have worked together for years. And it’s not just all the back and forths they’ve had — it’s also Captain Holt is gone, and there’s a new captain there, and the precinct is in turmoil. So it’s on these rocky seas they drop the vessel of their relationship. Are they thinking about the long-term implications, or are they just looking at the more immediate ramifications? DG: I think they’re keeping it real. Our goal, as writers, is to be as true to the situation with the two of them as possible. I think it’s a situation where you would say, “Let’s take things as they are; let’s not rush into anything huge. Let’s figure out what’s going on.” The stakes are fairly high because they work together, they know all the same people, and their relationship with work is very important to them. And so while they like each other, they’re also realistic. So that’s the struggle. What do you do when you start dating someone [you work with] that you like a lot? Looking to the precinct, Bill Hader is guesting as the new captain. What can you say about getting him for the show? DG: Our feeling is always that we want to get the absolute funniest person for any role. So from the very start when we were compiling lists about who could play Captain Holt’s successor, the first name at the top of ever list was Bill Hader’s. Obviously, we also love the fact that Andy [Samberg (Jake)] and Bill have such history [from SATURDAY NIGHT LIVE] and such chemistry. It just felt like such a coup to get him. His schedule is so crazy, his career is blowing up for wonderful reasons…so we kind of put him on the top of our list as a dream role, and we got very lucky and he was able to shoot with us. BROOKLYN NINE-NINE premieres Sunday, September 27th at 8:30 PM on Fox. And be sure to check back with Give Me My Remote after the episode airs for more from Goor!